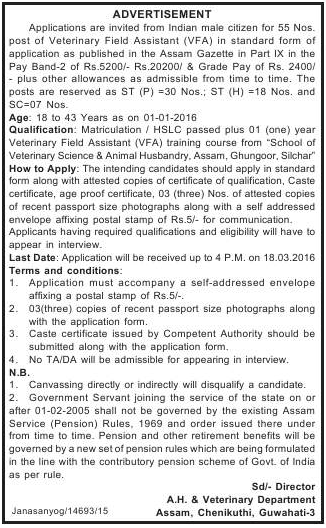 A.H. & Veterinary Department, Assam. Applications in Standard Form as mentioned in Assam Gazette are invited from Indian male citizens for filling up of the following posts under A.H. & Veterinary Department, Assam. Educational Qualification: HSLC Passed with one year Veterinary Field Assistant (VFA) training course from School of Veterinary & Animal Husbandry, Ghungoor, Silchar. Age: 18 to 43 years as on 01-01-2016.